Many Montreat residents, as well as absentee property owners and visitors who watched from a distance, can remember the 2016 wildfire that was so near to us–and the smoke drifting into the community–at Chimney Rock. A couple of years earlier Montreat saw up close the fire in adjacent Ridgecrest, pictured here. It can happen all too easily in our environment! Fire can spread rapidly, often fueled by dead leaves and two very flammable plants, rhododendron and mountain laurel. Montreat’s Landcare Committee, with agreement from the Town Council, is sponsoring the Firewise initiative, designed to raise our awareness of this issue and help reduce the probability of a damaging fire. Firewise (www.firewise.org) is a program sponsored by the National Fire Protection Association and supported by the North Carolina Forest Service. Representatives from the Forest Service have spoken to our community about this issue at recent Native Plant Sales and the 2017 Cottagers Meeting. There is nothing mandatory about the Firewise program. Every month the Firewise Committee will send out helpful emails explaining how to prune shrubs, reminding us about the importance of getting leaves away from our houses, asking people to report volunteer hours that they work on these projects, and additional information. How can you help? 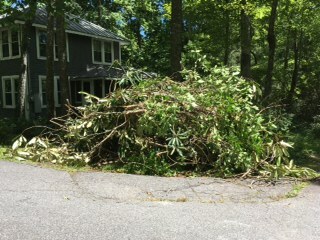 Follow the suggestions for clearing brush and report your hours to Nancy Midgette (midgette@elon.edu). See pruning tips provided by Dr. Midgette below. Let’s keep our beautiful Montreat home safe for all of our inhabitants! 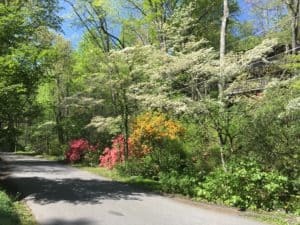 Montreat has plenty of fuel for a fast-spreading wildfire – in particular, leaves, mountain laurel, and rhododendron. Our initiative is designed to raise awareness among Montreat residents and to encourage each other to do what we can to reduce the potential for a destructive fire. After the mountain laurel in Montreat has just about finished blooming, it is time to prune. If you wait until late fall or winter, you will diminish the amount of blooms that will appear the following growing season. Remember that mountain laurel is an extremely flammable plant, so cutting it back from your house is a very good idea! Simple hand tools will suffice, unless you plan to prune only the tops of very tall plants. For the most part, a set of loppers for larger branches and hand clippers for small branches will do nicely. If you plan to cut it down to the ground, then some branches might be so thick that you will need a saw. 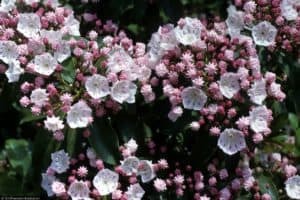 You may not have to prune very much off of your mountain laurel, but you can prune it all the way back into a leafless wood that is 2 to 4 feet off the ground. This can take 2 to 3 years to fully grow back, but the result is a beautiful and full bush. By the next growing season, new shoots will begin to form as long as the plant is healthy and well maintained. You will otherwise need to use a thinning and renewal method on your shrub. Remove dead branches to improve the light infiltration which will bring out the actual exquisiteness of your mountain laurel. Shaping shrubs consists of simply shortening each individual branch in a method known as heading. This involves pruning the branch right above a bud or even another branch. To ensure that your evergreen will be able to rejuvenate, be sure to leave some kind of foliage when thinning. Beware of dead zones of needles that have withered away on the inside of your mountain laurel. These needles have not gotten the right amount of sun to flourish. It is very important that all of the pruning that takes place on your mountain laurel is above its dead zone. Any cutting that is done below it could completely disfigure your shrub. Tools you need are simple – hand clippers and loppers. If you need to remove larger bushes, then a saw may be required. These shrubs make blooms that flower on the prior year’s wood. So you have to be careful when pruning them since buds for next spring will be made this summer, and you don’t want to prune those off. 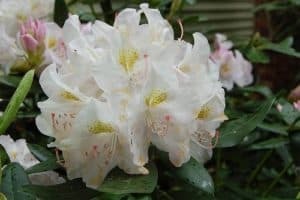 Don’t wait to prune your rhododendrons until late summer or even later, or you probably won’t get the flowers you’re looking for next year. For rhododendrons with large leaves, you want to prune right above their “growth joints,” the place where the plant is starting to grow. Just beneath that point is where dormant buds are, so take care not to cut them off. Small-leafed rhododendrons can be pruned anywhere along their stems. Cutting back a rhododendron heavily can stop the plant from flowering for a year or two. There are, however, two advantages to heavy pruning. First, they will come back low and full, and then you can keep them that way if they are close to your house. Second, you can prune pretty heavily if needed to get better shape for your bushes. The objective of our Firewise program is to have them at least 10 feet from your house; more is better. What should you prune away? Check the inside limbs for any that are dead or look weak. Any limbs on the ground or crossing over other limbs should be pruned away, too. You’ll be giving your bush better air circulation and a less hospitable environment for insects and disease. So get those loppers out and let’s have healthier mountain laurel and rhododendron and less fuel for a fire! !